A wonderful, scarce antique bodgers stool. A beautiful, very unusual & well loved piece of folk art with an interesting back story. With a curved seat, three pegged legs & the most amazing amount of wear the the stretcher below. 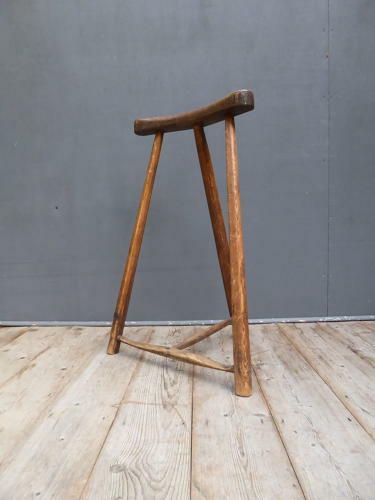 This stool, which is fresh onto the market, was formerly used by a 'bodger', an expert skilled in the art of green (unseasoned) wood turning. Bodgers would specialise in making Windsor chairs using hand operated 'pole lathes' which were more often than not, located within the woods themselves. This stool was carried to & from the woods each day & was custom made to allow the craftsman to get up & sit down easily again to operate the varoius lathes. Perhaps more of a bum rest than a stool! Wear commensurate with age, unrestored showing numerous pleasing signs of age, solid with no damage.